Congratulations! 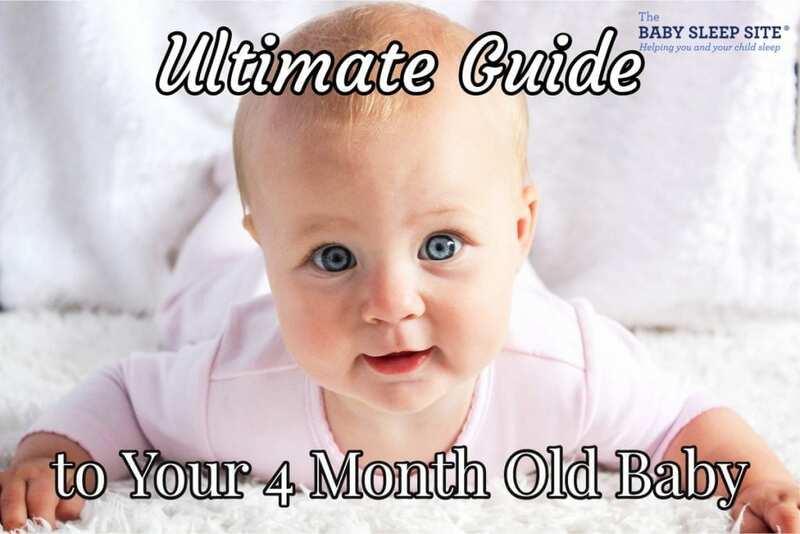 You’ve made it through the newborn days and you now have a 4-month old. Babies this age can become really fun as they become more aware of the world around them and you get to know their personality a bit more. But, they can also go through some big changes that impact how they interact with you, how they sleep, how they poop, their feeding schedule and so much more! Read on to learn more about your 4-month old baby. Your 4-month old is likely learning how to use her hands a bit more. Many babies this age explore their fingers and hands during waking hours and some (not all) begin to use them for self-soothing while they are sleeping. Babies are very curious about things around them and will grab almost anything nearby. This is about the time I stopped wearing earrings. 😉 Babies this age can also hold up their heads better and sit with support a lot of the time. Your baby can likely track items with her eyes, now, too. The most fun part is your 4-month old is likely smiling and possibly even laughing at you (or with you)! Some babies this age are also learning how to roll one way (it often takes several weeks/months to roll both ways). Offering ample tummy time is helpful, though my sons didn’t always like it and likely a reason they took quite a long time to crawl (don’t worry — they did, eventually!). Rolling over in their sleep is usually the most frustrating stage in this rolling business, but otherwise, some babies can really get around with this basic skill and can reach toys a bit out of reach. How much should your 4-month old weigh at this point? How long should he be? Should you be worried about your baby’s growth? First and foremost, your baby’s pediatrician will let you know whether you need to be concerned. If your baby’s weight and length are staying on their growth curve, even if it’s at a lower percentile, most likely you have no reason to worry. Do keep in contact with your pediatrician or health nurse if you have any concerns at all. According to the WHO growth charts, your 4-month-old will likely weigh around 15 pounds for boys and 14 pounds for girls, on average, and be around 21 inches long if they are in the 50th percentile. Keep in mind that the #1 most important thing is that your baby stays on his own growth curve (i.e. if he started on the 15th percentile, he should stay on that percentile or go up, not down). While some do fluctuate a tiny bit, your baby should stay on this curve until they stop tracking it so closely (or, again, go up). It is not necessarily “bad” if your baby is “only” in the 10th percentile. If your baby was born 4 weeks early (or more), then it’s very likely you need to use his or her adjusted age when you consider developmental milestones. Sleep-wise, we tend to see premature babies track somewhere between their actual and adjusted ages. All babies develop on their unique timeline and premature babies are not an exception. In some areas such as gross motor skills, your baby may be ahead or behind or right on target, but in other areas such as fine motor skills, it could be opposite. I like to think that all babies develop what interests them most first because they are simply trying really hard in that area. My first son loved sign language because he had a lot to say (and still does! ), but his younger brother was never interested and thus never did sign language (and he still is a young man of few words!). In the end, unless there is a developmental delay, try not to compare your baby with others too much (even their own siblings!). Your healthcare provider will tell you if you need to be concerned. At 4 months old, your baby will need around 11-12 hours of sleep at night and 3-4 hours during the day, on average, for a total of about 16 hours of sleep in a 24-hour period. Of course, all babies are unique and some will need less sleep and others will need more sleep. These are just averages and it’s important to observe your own baby. Although some babies are very happy despite an obvious lack of sleep, most will indicate they need more sleep with their mood and behavior. Fussy babies tend to be on the clingier side and often need more sleep. If you aren’t enjoying your baby during the day, because of how fussy he is, consider shortening the time he’s awake and getting him more sleep. You might be surprised at the happy little guy or gal hiding in there! If your baby is sleep-deprived, it may be due to the fact that her sleep has fundamentally changed. As a newborn, she spent a lot of time in deep sleep, but after what we call the 4-month sleep regression, she now cycles in and out of light and deep sleep and goes through sleep cycles. If she doesn’t know how to get herself back to sleep, she may be waking much more frequently at night, which is making you exhausted. Keep in mind that she will not go back to how she slept as a new baby, so it is key to help her learn to sleep in this new way. Many babies will find their own way and others need your help, hence our very popular free e-book, 5 Ways to Help Your Child Sleep Through the Night. Pick up your copy anytime! Another thing that could be changing at this age is your 4-month old’s feeding schedule. Even if your baby was sleeping through the night without feedings, we sometimes see a night feeding come back around this age. Keep in mind that newborns don’t move around too much, but now your baby may be sitting or rolling, spending more time awake, and generally burning more calories during the day. The general consensus at the time of writing this is no, not yet. We start solids closer to 6 months old. But, check with your doctor about what’s best for your baby. We have sample sleep schedules for all ages, but here’s one for you to consider trying. Just remember that your baby is unique and may need different nap and bedtimes. Need help with naps or want more sample schedules? Consider checking out our e-Book with over 40 sample schedules, Mastering Naps and Schedules. Did you ever think you would talk about poop as much as we do after we have babies? I have marveled at the 30-minute conversations I’ve had about poop since becoming a mom! But, it is very important stuff since your baby’s poop can alert you to some serious health issues. A baby’s poop can vary in color quite a bit from a breastfed baby’s mustard-colored yellow poop to a more typical brown (and smelly) poop once a baby starts solid foods. If your baby’s poop is red (indicating blood), chalky white (indicating absence of bile), or black (normal for newborns, but after 3 days old can indicate blood in the gastrointestinal tract), call your doctor immediately! Any other colors are probably just fine, except if it’s bright green and frothy, your baby is likely breastfed and is getting more of the fore milk, instead of the hind milk, and needs to drain your breast. If your baby isn’t acting like herself, though, she might have a virus. In terms of consistency, baby poop is often looser than ours, so it’s usually nothing to worry about unless it’s just too watery, which could be diarrhea. It’s best to talk to your doctor, so they can check for infections or other health issues that could be causing it. On the flip side, if your baby is straining and the poop is too hard indicating constipation, you may be feeding him too much solid food and/or he’s not getting enough liquids. Try to adjust the milk-to-solid feeding balance, but if that doesn’t help or you are concerned, definitely talk to your doctor! Ah, the fun stuff! Your baby is showing more and more of his personality every day, I’m sure. And, so much of it is fun with smiles for almost everyone. But, some of it isn’t so fun, too. Remember when people would ask nature or nurture? Before I had a baby, I thought so much of behavior was nurture…we teach our babies to behave a certain way. Boy was I wrong! I am now a big believer in nature. My sons were born with so much personality and ways about them and, as they grew up, I kept seeing the same traits come out from being afraid of strangers from a young age to their first reaction to certain situations. Intensity – How strongly he reacts to something (good or bad). Babies that “go from 0 to 60 in a second flat” are very intense! Persistence – How easily your baby gives up on something such as a toy that’s taken away. Easy-going babies tend to get over things quickly and move on. This is not a bad trait. Very persistent babies don’t give up easily. At all. Again, this isn’t bad either. Just two different types of babies that will approach life in their own ways. Perceptive-ness – How much your baby notices things around her. Those who hear “she’s so alert!” may have a perceptive baby. Adaptability – This indicates how easily your baby eases into new situations. These are babies who are also easy-going, crying for very short periods at things they don’t like. Regularity – This indicates how predictable your baby is. Can you set a clock by his poop schedule or when he wakes up for the day? Those babies are highly regular. Mood – Some babies are soooo happy almost all the time and others are very serious. Serious babies may be hard to get a smile out of (but watch out when they do!). Want to know more about these traits? If you haven’t read our series about baby temperament, be sure to check it out! For the most part, babies are so curious about everything, you don’t really have to buy toys. So many babies can play with paper that crinkles or other household goods. They don’t know how sophisticated (or not) an item is. So many parents spend hundreds of dollars on toys only to find their baby loves to play with the box. And, some toys can be downright scary! To develop your baby’s pincer grasp, you will probably want to wait until he or she is a bit older as we don’t want her to choke on anything. Many people wait until their baby is old enough for Cheerios or whole peas. Therefore, I don’t have any toy recommendations for fine motor skills at this age. I’m a big believer that you know your baby best and if you have a feeling something isn’t quite right, trust your gut and talk to your doctor. And, consider getting a second opinion, if necessary. I have worked with families who just knew something wasn’t quite right. In one case, the baby ended up having a tongue and lip tie after a couple of doctors and lactation consultants didn’t diagnose it. If you feel in your heart of hearts something isn’t right, there might be something wrong and it’s often better to find out sooner rather than later. That said, it’s easy to worry unnecessarily when you have this new baby you’re raising and you certainly don’t want to do it “wrong.” I was there many times! You’re not alone. Remember that all babies will develop on their own timetable, but if you are finding your baby falling more and more behind as far as what he’s “supposed” to be doing, it doesn’t hurt to check it out with your pediatrician or other specialists. Early intervention is always preferable and you could help your baby get back on track. Well, there you have it. You’ve likely learned a lot about your 4-month old. Tell us about him or her in the comments!